If you could grow the perfect grapevine, what would it be or do? What would its fruit be or look like? How would it perform throughout the season, given your climate, soil and labor availability? Essentially, these were the dreams grape and wine industry representatives were asked to entertain when surveyed about the most desirable grape traits. 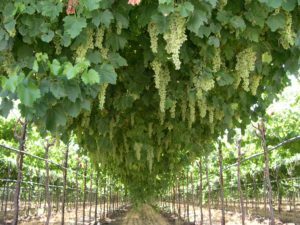 In order to help guide current and future grapevine breeding and/or genetics research, like VitisGen2, NGRA’s Genetics & Grapevine Improvement Research Theme Committee recently surveyed grape growers and producers to understand the traits—by sector and, for wine grapes, by region—that are most highly desired. Industry subject-matter experts from each sector and from grape-growing regions across the U.S. were polled. Click to view or download complete results, including results for wine, juice, table and raisin grapes, broken out by sector and region. Apparently, this is the stuff dreams are made of, if you’re a grape grower or producer!